Walton S. "Wally" Russell was born on April 25, 1910 in Dickinson, ND to Hoy S. and Cora (Walton) Russell. He moved to Mandan with his family in 1915 when his father began the Mandan Creamery and Produce Company. After graduating from Mandan High School in 1928, Wally attended St Thomas University in St. Paul, Minnesota. He transferred to the University of North Dakota - Grand Forks to attend law school. While there, he was a member of the Sigma Alpha Epsilon fraternity and served as president of the intra-fraternity council. 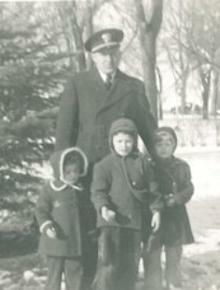 Upon his graduation from law school, he returned to Mandan where he went into private law practice. At the urging of his father, Wally went into the dairy and food distribution business and served as president of the Mandan Creamery and Produce Company. Wally met Mary Jane Phillips attending law school in Grand Forks. The couple were married in October of 1934 and would raise their family of two daughters and a son, Cory, Walton, Jr. and Rebecca, in Mandan. In 1944, Wally enlisted in the United States Navy and served until his discharge in 1946. Upon his return to Mandan, resumed his service to the Mandan Creamery and Produce Company until his retirement in 1972. Wally then returned to the private law practice and remained active in that profession until 2000. Wally was co-owner and president of Mandan radio station KGCU from 1943 to 1956 as well as co-owner of the Blue Ribbon Hatchery. Since public service was so important to him, he began as one of the original members of the city planning board and served as chairman for 25 years. 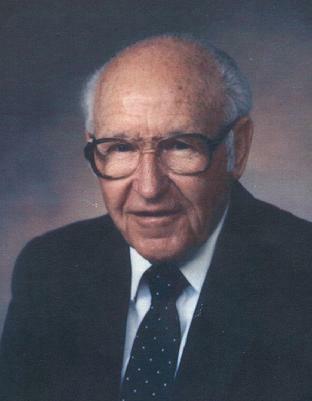 He was a 69 year member of the Mandan Rotary Club and was the last remaining founding member of that organization. He was a member of the Mandan Chamber of Commerce, serving as one of the youngest presidents ever to be elected. Wally was one of the orginal 10 men to charter the Mandan Rodeo Association, serving on their Board from 1940 to 1955. For his service to the event, he was elected Grand Marshall of the Mandan Rodeo in 2005. He was part of the Lower Heart River Water District and served as its chairman for many years. Wally also served as chairman of the Memorial Mental Health and Retardation Center. A long standing member of the Greater North Dakota Association, Wally was director and chairman of the Tax Council of the GNDA. He was a Special Assistant Attorney General assigned to the State Board of Professional Engineers and Land Surveyors. He was appointed by the governor for a five year term on the ND Merit System Council. He also served on the Governor's Management Task Force in the early 1980s. Wally was a member of the Regional Advisory Council for the West Central Human Services Center and served as a Director of the Dakota Foundation. He was a member of Chapter 365 of the Mandan/Bismarck SCORE organization. Wally was active in his faith based organizations as well, serving as a Trustee for St. Joseph's Parish, the building committee for Christ the King Catholic Church and its Board of Trustees. He was also a Member of the Board of Regents at the University of Mary in Bismarck. He enjoyed golf, fishing and traveling with his wife Mary Jane, and most certainly civic affairs. Wally's grandchildren thought their "papa" was a true example of what a man should be. 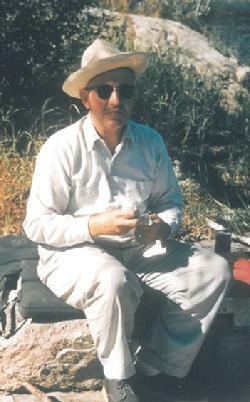 Walton Russell died on May 7, 2006 and is buried in Mandan beside his wife in Union Cemetery.